We evolved staring down predators, not staring at computer screens. Our ancestors ate bone marrow, not donuts. Grok the caveman followed game, not twitter feeds. These kinds of "disconnects," between the primal lifestyle our genes evolved to expect and the digital lifestyles we live, stress us out. But here we are. And as I argued in Will humans become obsolete?, the exponential growth in technology means we will be forced to assimilate it or be out-competed by it in the labor market, just like Grok was forced to throw out his stone ax for iron. So how can we stay competitive and yet happy and healthy at the same time? Either we match the technology to our genes and/or we modify our genes to fit the technology. We can't genetically engineer ourselves yet, so here's my three step plan for staying on top of the food chain: 1) Identify technologies that can enhance my performance, 2) Assimilate them in such a way as to maintain or enhance my health and happiness, and 3) Repeat. This is a twist on Mark Sisson's approach in Primal Blueprint, which is to identify the behaviors and environments that turn on ancestral genes and generate biological responses for health and happiness, and find ways to incorporate them into modern life. We can't hunt woolly mammoths like Grok, but we can eat mostly meats, fats, and vegetables, spend lots of time outdoors, and rise with the sun every morning. This is what folks mean by "going primal," and I can testify to it's effectiveness: The Primal Blueprint has made me fitter, trimmer, and happier for about a year now. 1) Identify new technologies that can do activities I need or want to do better or for less cost than my body and/or mind alone. I'll use the law of comparative advantage here: I may be able to cook burgers better than a robot, but if the robot can do it for me cheaply while I do something only I can do that's worth more to me, then I give the task to the robot. 2) Assimilate the new technologies in such a way that they do not adversely affect my health and well-being, and look for new activities that can replace the role these activities may have played in generating health and happiness in my life and. In his latest book, The Primal Connection, Mark Sisson shows how technology can substitute for the behaviors and environments that produced optimum health and happiness for our ancestors. One study found that simulated windows (digital screens with outdoors scenes) had a positive psychological effect on people. Likewise, I can testify that waking up to digital birds singing on my Android (Gentle Alarm) is much less stressful than being jolted by screaming beeps. There is probably a potential technological solution to every primal disconnect created by technology. 3) Repeat as often as possible to be the fastest, smartest, healthiest, happiest human possible, realizing that the definition of "human" may change somewhat along the way. How about some examples, just ten to get us started. Please help me add more. The first one's easy: Step 1) The days of memorizing facts are over. My memory is easily expandable, through the internet, to all published "facts" in the world. The time it takes for me to type in a Google search is all the time it takes for me to "recall" a fact from my internet "memory." Step 2) I will try to replace rote memory tasks with the internet in order to free up mental resources for tasks that Google cannot replace (yet). Just as calculators allow me to spend less time calculating so I can solve more and harder problems, switching from organic memory to Google will allow me to spend less time memorizing and more time problem solving. Are there some potential negative side effects of this? Does rote memorization have some beneficial effect in my brain that affects my health and well-being? I don't know, but I doubt it. In fact, I think it probably reduces stress not to have to worry about memorization. But I need to be on the look out for such negatives and address them. For example, while it seems like a no-brainer (pun intended) to replace rote memorization with Google. I want to be careful I don't let it think for me. And there is an obvious caution here: Don't get distracted from your task. The internet is a tremendously distraction-rich place. But hey, there are tech tools for staying focused as well. Example #2: Step 1) Commuting stinks. It takes too much time and fuel, and increases the time I spend sitting on my rear end staring at asphalt and the backs of cars. It can be replaced by remote/online work. Meetings and classes can be attended remotely using Google Hangouts or Skype. As a teacher, I can collect assignments and deliver content through Moodle and Youtube. Drawbacks? While remote work may decrease face time with colleagues, it stands to increase face time with the people most important to me. Conclusion: Try to work remotely/online as much as possible. Example #3: Replace paper planner with Google Calendar. Reminders are awesome, aren't they? Example #4: As an avid hiker, I like this one: Replace orienteering courses with GPS (but carry a compass just in case). Example #5: This one's obvious, but I have room for improvement on this: Replace paper filing with scanning, online forms, digitial memory and DVD backup. Example #6: Replace some reading with listening to audiobooks or lectures while commuting (yeah, I haven't implemented Example #2 yet). This has been my secret for years. Example #7: Replace stores with online shopping. Be careful here. I'll lose face time with people and need to be sure to use some of the time saved to increase time with other humans in my life. But I don't mind trading time with strangers for time with loved ones. Another caution: Make sure you don't waste MORE time online than you would have in the store. Amazon is fantastic, but a potential black hole for your time. Example #8: Online banking, automated bill pay, payroll, bookkeeping and billing. This is a work in progress for me. Example #9: Texting, while not safe on the road, is quicker than the phone and a great way to keep in touch with real people in your life. My students keep in touch with parents like they never could before. In fact, despite all the whining to the contrary, I think Facebook and Twitter can draw us closer to real friends and family, especially distant ones, as long as we don't get distracted by all the extraneous "friends" (acquaintances) scrolling (and trolling) down our feeds. Example #10: In school, why even bother with long division anymore? Why memorize derivatives and integrals? And let's not stop there. Wolframalpha.com can do everything a calculator can do and much, much more, let's take advantage of it. Are we worried we'll lose basic math skills? So what, if we gain greater, more advanced skills? How many of us can do long-hand square roots, for goodness' sake? And how many kids knew what an integral was in high school 50 years ago? The future: I'm waiting for a Hyperion-style direct brain interface, so I don't have to type in Google searches and can run WolframAlpha in my head. That will be cool. And when I can write a blog post with my thoughts, that will be really cool, too. And of course, the Star Trek Transporter will be awesome (not to and so will Bones' scanner). So my plan is to repeat the 3 steps as often as possible until I am as "borg" as I can happily and healthily be. Grok is great, but if he stays Grok, he won't last long. He'd better switch to Cybergrok if he wants to be happy and healthy in tomorrow's technological world. And to tell you the truth, the primal life is not really my "ideal" life. If I could avoid it and still be healthy, I'd rather not kill animals for food. If I could do so and still be healthy and happy, I'd eat donuts. I love donuts. As yet, we don't have a technology that will allow me to eat them healthily, but I will rapidly assimilate it when it comes. 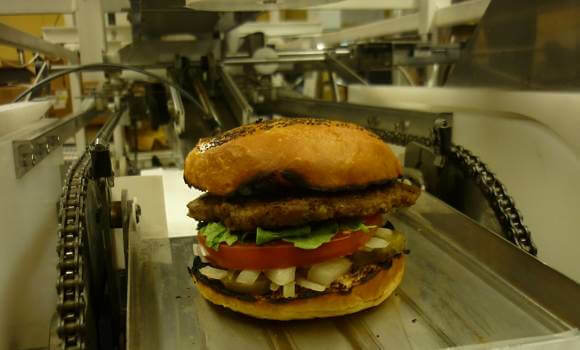 When I heard about the robot that made 360 burgers per hour, it got me wondering about technology. Will human labor become obsolete? Obsolescence overtook the blacksmith, the weaver and many other tradesmen of the past. It is overtaking the cashier, the printer, and soon the short order cook. Many of my teacher colleagues are worried about the growing online education movement, and accountants, stock brokers, managers, salespeople and other "white collar" workers would do well to watch online developments in their fields. If we extrapolate this trend into the future, it might seem as if the exponential explosion of technology will soon make all human labor (and consequently, humans themselves) obsolete. But technology doesn't eliminate labor, it only changes the kind of labor that's in demand. The question is, will we let our machines out-compete us in the labor market of the future, or will we join them. Every new technology: printing press, steam engine, locomotive, plane, or computer, eliminates the need for some form of human labor. The mere invention of a stocking-making machine in the late 1800's put 50,000 stocking knitters out of work. And for a more extreme example, the work being done by steam engines in 1887 was equivalent to that of 1 billion men. And yet, every time, though there is an initial shock of unemployment in the affected industries, the long-term result is usually more jobs. As for the English stocking knitters, Hazlitt writes that "before the end of the nineteenth century the stocking industry was employing at least 100 men for every man it employed at the beginning of the century." And obviously the steam engine did not displace 1 billion workers. There were only a third as many alive on the Earth at the time. There are a few reasons technology doesn't drive employment to zero. Rising population creates increasing demand, and while technology saves labor in one area, it often requires new labor in another. Steam engines require people to build them and mine the iron and coal, for example. But more importantly, labor is a natural outgrowth of human creativity and desire. If it were about meeting the basic needs of a static population, technology could, it seems to me, eliminate the need for human labor. But though human needs may be static, human desires are not, and as new technologies eliminate the need for old vocations, humans find new things to do. Human productivity is like a tree. A new idea is a new bud, sprouting from a branch as resources and labor are brought into play, drawn up from branches, trunk, and roots below to fill a new niche in the canopy of the tree. And each new twig, at first costing labor and resources, eventually becomes part of a greater foundation, supporting further growth and exploration of the undiscovered potential of the universe. And just as the twigs and leaves multiply to fill endless new niches and expand the canopy upwards and outwards to catch the sunlight, so the ideas of humankind multiply without end. And so there can be no end to labor, because the the world of ideas is infinite. But the nature labor changes, and this may be cause for some concern. Demand for hands, shoulders and backs decreases, and demand for computer programming and creative ideas increases. It is an evolutionary process, and it seems clear where it's headed. Automation, even artificial intelligence, supports the expansion of human activities, but what happens when computers can do every part of the process, from initial idea, to invention, development, and production, when our technology begins to compete with us in the canopy of the tree of ideas? This coincides with the technological singularity, a concept made popular by inventor Ray Kurzweil, who believes it is coming soon. He bases his belief on the demonstrably exponential growth of technology over the last few centuries. Kurzweil predicts machines will rapidly exceed human intelligence, since they will be able to build new machines unconstrained by the limits of the organic human brain. Sci-fi? Maybe. Maybe it is simply impossible to equal the human mind. But science fiction has often become reality. It was not long ago we watched Captain Kirk open his "flip phone" to communicate with the Enterprise. And how far is it, really, from cleverbot (if you haven't played with cleverbot.com, do it now) to a "human" computer, especially considering Moore's Law? 2) We merge with the machines, as Kurzweil predicts. 3) We destroy the machines in a Dune-style Butlerian Jihad. As much as I sometimes envy the simple life of my black lab, and as fun as option 3 might be, I'm leaning toward option 2, since it seems to me it's already taking place, and it's not so bad so far. Calculators have changed the way we do math, and Google may already be changing our brains. What's the difference if the technology physically moves inside our skulls. I admit, the idea of being part computer is a bit discomfiting, but does being human require that you not try to improve yourself? I think we can augment ourselves while retaining the essence of what it means to be human. And if that's what we need to do to survive in the market of the (near) future, then we adapt or we die, just like our ancestors did when they abandoned sticks for chipped stones and stones for iron, horses for cars and pencils for calculators. Either way, the tree of technology grows ever on and on, expanding the realm of possibility. The only question is, will we be a part of it or not. And while this may seem like sci-fi speculation, these changes could be right around the corner: 2045, according to Kurzweil. I'll be 73. And right now, every day, we are faced with similar choices regarding technology. Compete or merge. Recoil from burger-flipping robots and self-checkout isles, or figure out how to carefully assimilate them. Shun calculators, GPS, cell phones, Kindles and the internet, or use them to augment our intelligence, intentionally and effectively, until they become a part of the trunk of a thriving, more successful, effective and fulfilled life.